Making Spirograph designs is a bit like riding a bike. Once you get it, you won’t likely forget it – at least that was my experience, because I learned it as a child, and had no trouble coming back to it as an adult. But how to explain it to other people? There are lots of little things that I just do without consciously thinking about it, and that I wouldn’t think to explain. 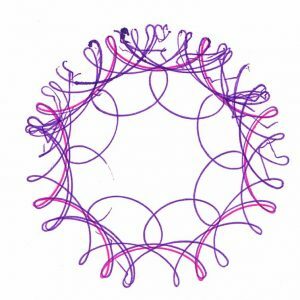 Which is why I like Sonya Pickens’ Spirograph Tutorial video. Sonya had to figure it out as an adult, and she explains some of the really basic things that I wouldn’t think to explain. 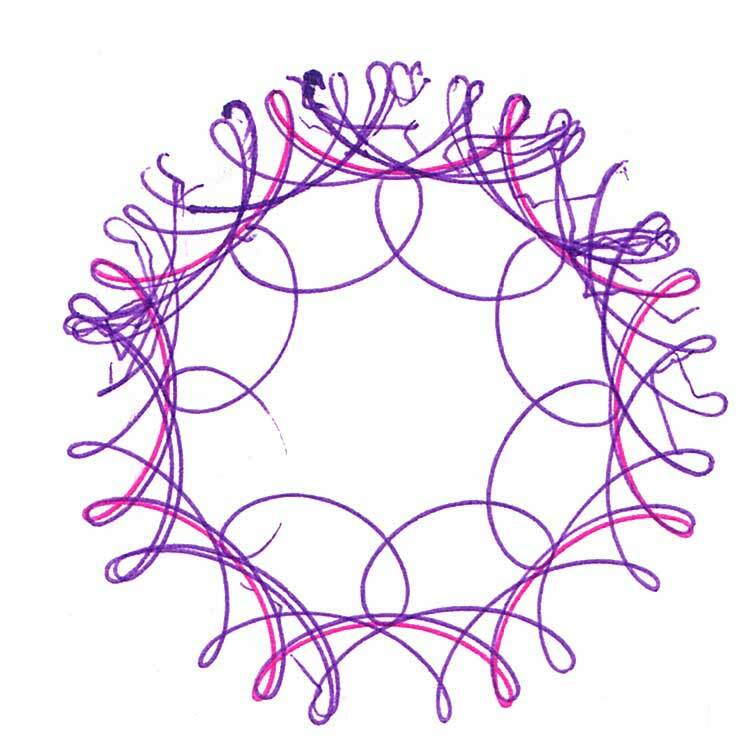 If you’re struggling to get the hang of Spirograph, this video may really help you. Plus she’s an artist working in a lot of different media, and you might get inspired by her work to do some different things with your Spirograph designs. She does a lot of other circle-based art too. Here’s a link to her Facebook Page. Hi. When I’m using the 144/96 ring with the 84 wheel on hole 1, the wheel doesn’t move as free-flowing and gets stuck often, even when I reduce pressure. How do I obtain a slick surface on paper? That’s the most difficult combination of all: the largest wheel (84) inside the smallest ring (96 teeth on the inside) and the outermost hole (1). It’s pressure from your pen against the side of the hole that advances the wheel around the ring. It is pushing against the side of the hole in the direction of movement. That direction is changing all the time, but in this combination – this hole in this wheel in this ring – it’s changing particularly fast as it traces a tight loop, especially at the points. You’re almost drawing a circle. Let the wheel guide you, not the other way around. You can even use your other hand to move it a few teeth while you feel where the pen wants to go. However, that can easily lead to a jagged line if the pen is not moving against the smooth edge of the hole. Practicing with smaller wheels, especially 60 and larger because they too make loops, will help you lead up to this one. So will practicing with the higher numbered holes on wheel 84. One thing I don’t understand is why you ditched the tray. It has large numbers next to each wheel and it is so easy to put the wheel back in the right holder. You almost couldn’t lose one. Note that this video is by Sonya Pickens, not by me. The best way to ask her questions would be to go to the video on YouTube and use the comment section there. She might not see them here. I wouldn’t want to be without the tray, myself. However, I lost the cardboard cover long ago, so it’s a bit awkward to store and transport. Ooops! Sorry, I didn’t read that this video was someone else’s. I thought it was yours. I’ll go and comment on Youtube. Thanks. The box is really lousy pulpboard. Nearly all the ones I see on eBay are at least broken at the corners, including the two I recently bought. My name is Steve E White. I am using Wild gears on a machine called a Rose Engine. I can then put these cool patterns on wood and metal. Also in 3D. My problem is a users guid could put me on to cool patterns without making hundreds of pcs of scrap. Please let me know where I can post a photo and I’ll show you what Wild a Gears can do in 3D. I live in St. Louis MO. If anyone lives close. This is very interesting. I’d love to see pictures of it. Unless you have a place to upload photos and know how to reference it in HTML, it’s hard to do in this comments section. But if you’d like to send me some photos, along with some information, I’d be happy to make them into a blog post with full credit to you of course. I’ll send you my email address directly. Do you try designs on paper first before you commit them to wood or metal? That’s what I would do. If that even works with a Rose Engine. A rose engine has its own gears already right? How do you integrate external plastic gears? No a rose engine doesn’t have gears. It had rosettes that make a pattern. Aaron was nice enough to program a 1.000 inch hole in the middle of some of the gears. So they mount on the machine. I have been making patterns all day. I have sent photos of how this works. One can go to YouTube and search Rose Engine lesson 28. I show how used Spyrograph gears. I see… it worked before. This sounds really dumb from a 50 year old man. I can’t get the designs I’m making to look like the ones in the book, no matter how carefully I follow directions they come out completely different. I must be doing something obviously wrong. It does take practice. Learn to follow the lead of the gears. To not press too hard. At first, don’t worry about the book; just pick any wheel and ring and work on drawing a complete pattern successfully. Thanks for replying. I get the mechanics of it, but the designs don’t look the same as the ones in the book. If this allowed pictures I’d show you what I mean.